As a health care professional who works in a large hospital, I am only too aware of the kind of spooky ghosts stories which get told around the nurses' station during a quiet moment on a night shift. A medium friend of mine used to see all manner of ex-patients wandering about, and a particularly disturbed patient of mine was referred for psychiatric evaluation in part because of his 'hallucinations' of dead people. However, relating such cases from a working hospital brings with it certain risks - insensitivity, confidentiality, etc. Richard Estep wisely confines the large part of his book to ex-general hospital/mental health institution sites whose dilapidated condition lends a certain atmosphere to these kinds of macabre studies. Think "Verrückt" from Nazi Zombies. The locations lend themselves to being legendary haunts through their often desolate ruination and abandonment. Theirs is also a rich historical source, which is as fascinating as the ghost stories which emerge from their nocturnal eeriness. His first hospital environment, and one of the only ones I think it's fair to say that he actually visits and investigates himself, is Asylum 49, a haunted hospital theme attraction, undergoing constant renovation. I've often noticed, as a reasonably seasoned ghost-hunter myself, that knocking a building about can often be a trigger for various spooky manifestations. Ghosts don't seem to like their environment getting changed around them, which is entirely understandable really. Their alleged presence, whether as a result of the renovation or not, can do nothing to harm a spooky attraction such as this! A little further into the book, the author discusses 'pareidolia', which is the brain's tendency to see faces in environmental features - clouds, wallpaper, Martian mesas... He is a paramedic by trade, and balances a healthy scientific disposition with a passion for the paranormal. Similarly, then, Richard Estep plainly discusses the likely mundane explanation for most orb photos, and gives space to comments by other investigators which signal how we, as witnesses to the weird, can let our imaginations run riot. That said, a lot of the material in this book is gleaned from a multitude of different sources - the internet and YouTube mostly, I think - and the author does have a tendency to reproduce the accounts of ghost-hunts and haunted sightings from Most Haunted-style TV shows with often little sceptical comment, or alternative explanations. So, he balances out scientific enquiry with a certain amount of credulousness. But without a bit of credulousness, where would be the fun? 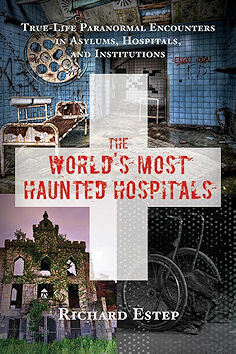 I was naturally drawn to descriptions of haunted hospitals in Britain, including the abandoned and disintegrating Nocton Hall in Lincolnshire, University College Hospital in the Bloomsbury borough of London, and St Thomas's in central London. England's gloomy winters make for a wonderful backdrop for haunted locations, and hospitals are no exception. Enhancing that atmosphere is the history - the association between Florence Nightingale and St Thomas's (whose corridors are sometimes frequented by a grey lady who presages death), and the macabre remains of philosopher Jeremy Bentham with UCL - whose 'auto-icon' can truly said to be 'Lost' in this regard. This kind of ghoulishness picks up another theme which makes these kinds of institutions stand out as potential haunts of the darkest character. Quite so. In the bad old days, some pretty horrible 'treatments' were carried out on patients in the name of science. This is especially true of the old lunatic asylums, whose patients were often subjected to horrific procedures, such as lobotomies and ECT, without any real attempt to anaesthetise their suffering. Aradale in Australia is a prime example, with ghost-hunts turning up some really scary moments within its dark, horror-ridden corridors. A completely different historical setting provided one of my favourite chapters - the lagoon island of Poveglia near Venice, in Italy. This island proved a useful dumping ground for both the living and the dead, especially during times of plague, and such like. The island is practically a mound of skulls and bones, it seems, with the buildings set upon it long since abandoned. What a ghost-hunt that would make! And, indeed, the author delivers a description of a ghost hunt conducted by the Ghost Adventures team. This becomes a running theme throughout the book. This was certainly true of the excellent chapter on Yorktown Memorial Hospital, which included descriptions of several ghost-hunts conducted by different teams, comparing their data and results. There is plenty of interesting material to read about and consider, of course, and for anyone interested in learning about ghost-hunting, this book provides a good array of investigations, the kind of equipment used, the techniques employed, insights generated from interviews with the investigators etc. There are ideas on what you should concentrate on doing, and what you should avoid. For instance, reconnoitring a location in the daylight before a nocturnal ghost-hunt is a good way to spot power sources, standing water, building hazards, and such like (p228). Sound advice! The downside of this is that the book feels like an armchair expert's blog; offering admirably compiled material from other people's research in the field, with a side commentary. There are chapter notes with links to resources, and a few images, but I would have preferred to have read a few more personal accounts of ghost-hunts, to be honest. it's clear from the author's website that he engages in these activities often enough, after all. I suppose it's easy for me to say, living in a concentrated land like England, with its never-ending array of haunted pubs, castles, manors and churchyards. Travelling the distances required to visited haunted locales in a land of continental size, like the U.S.A., is another matter entirely, of course. On page 101, the author asks why hospitals become more paranormally active once the living patients have moved on? I would argue that ghost encounters can occur anywhere, at anytime. Perhaps it's the case that if you immerse yourself in a spooky environment, then your awareness of such events will be raised - your barriers to such paranormal incursions into your consciousness dropped. Furthermore, there is no way to scientifically compare the levels of paranormal activity in an abandoned hospital with those in a working hospital, because there's no way any right-minded hospital board are going to let an investigation take place. So, this book provides a key lesson in how the look and feel of an environment sets the scene for a haunting, above and beyond what actual paranormal activities might be going on. Subtitled: "True-Life Paranormal Encounters in Asylums, Hospitals, and Institutions"